During his short time in South Bend Rossmel became one of my favorite Silverhawk players. It didn’t hurt that he was a catcher, but he really seemed to have fun playing the game. I would love to see him play for the Diamondbacks one of these days. 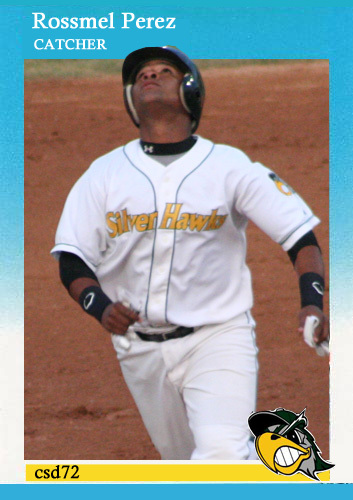 I had this picture of Rossmel taken in 2009 during a Silverhawk game that I wanted to put on a card. For some reason I wanted to see how this looked on the ’87 Fleer template that I had. I thought about trying an older card, but this was way too much action for anything too old. I like how this card turned out. This entry was posted on July 30, 2011 by Pinola Photo. It was filed under 1987 Fleer, Arizona Diamondbacks, C, South Bend Silverhawks and was tagged with 1987 Fleer, Fleer, Rossmel Perez, Silverhawk, South Bend Silver Hawks.